This is the latest accepted revision, reviewed on 21 January 2019. A.N.T. 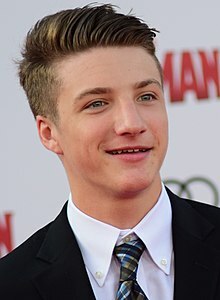 Farm, Mighty Med "Lab Rats: Elite Force"
Jake Short (born May 30, 1997 in Indiana) is an American actor. He has played the roles of Fletcher Quimby in Disney Channel's comedy series A.N.T. Farm and Oliver in the Disney XD original series Mighty Med and Lab Rats: Elite Force. His first major role was Fletcher Quimby in Disney Channel's comedy series A.N.T. Farm. He also starred as Nose Noseworthy in the 2009 film Shorts, and has acted in numerous commercials. In 2013 Short began co-starring as Oliver on the Disney XD original series Mighty Med and its spinoff Lab Rats: Elite Force. 2009 Zeke and Luther Kenny Coffey Episode: "Bros Go Pro"
2009 Dexter Scott Smith Episodes: "Lost Boys", "Hello, Dexter Morgan", "The Getaway"
2010 Futurestates Tyler Episode: "The Other Side"
2011 $h*! My Dad Says Timmy Episode: "Goodson Goes Deep"
2014 Just Kidding Jake Episode: "Just a Catchphrase"
^ Not related to the subsequent Kirby Buckets TV series. ^ a b "Indy Native Jake Short Talks About Life on TV". WXIN. Archived from the original on October 27, 2014. ^ "Cast bios for A.N.T. Farm - Jake Short "Fletcher Quimby"". Disney Channel Medianet. Archived from the original on November 5, 2011. ^ "Jake Short Talks A.N.T. Farm, Dexter and Selena Gomez". BSC Kids. September 16, 2011. Archived from the original on November 5, 2011. ^ Fries, Laura (June 16, 2011). "Review: 'A.N.T. Farm'". Variety. Retrieved September 12, 2015. ^ Chang, Justin (August 9, 2009). "Review: 'Shorts'". Variety. Retrieved September 12, 2015. ^ Ng, Philiana (September 9, 2013). "Disney XD Sets Debut for 'Mighty Med' Comedy Series (Exclusive)". The Hollywood Reporter. Retrieved September 12, 2015. ^ Wagmeister, Elizabeth (September 3, 2015). "Disney XD Greenlights 'Lab Rats' and 'Mighty Med' Spinoff Series". Variety. Retrieved September 4, 2015. ^ Andreeva, Nellie (September 3, 2015). "Lab Rats & Mighty Med Spin-off Series to Succeed the Two Comedies on Disney XD". Deadline Hollywood. Retrieved September 3, 2015. This article about an American television actor or actress is a stub. You can help Wikipedia by expanding it. This page was last edited on 21 January 2019, at 21:01 (UTC).